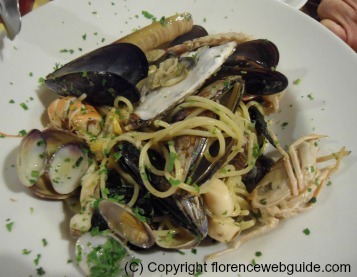 Fish restaurants in Florence offer incredibly creative seafood dishes and fish and pasta combinations. If you love pasta with seafood you'll find dishes like noodles with a creamy crab or lobster sauce, risotto bursting with all types of shellfish or seafood lasagna. Of course, there's also the ever-popular spaghetti with clam sauce or with mixed seafood. A handy thing to know: spaghetti with seafood can be served 'white' (no tomato in the sauce) or 'red' (with a dash of tomato to add extra color and flavor). 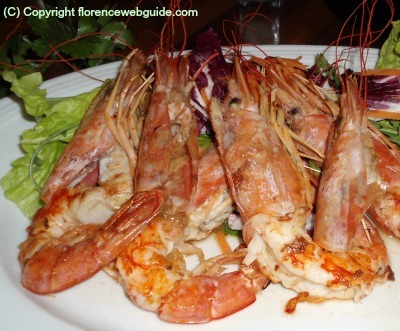 Another very popular fish dish in Florence is the mixed seafood platter, either fried or grilled. This usually includes shrimp, calamari (squid), and other assorted Mediterranean fish like swordfish or sea bass. Read below to find out about some of the most popular and 'in' places for seafood. Lobs is one of the best fish restaurants in Florence. 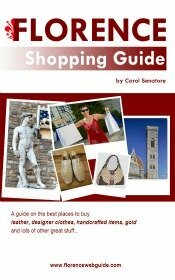 It's as centrally located as can be, near the station, the market and not far from the Duomo. The restaurant has a casual easy-going fun atmosphere that is meant to resemble a Caribbean style boat. 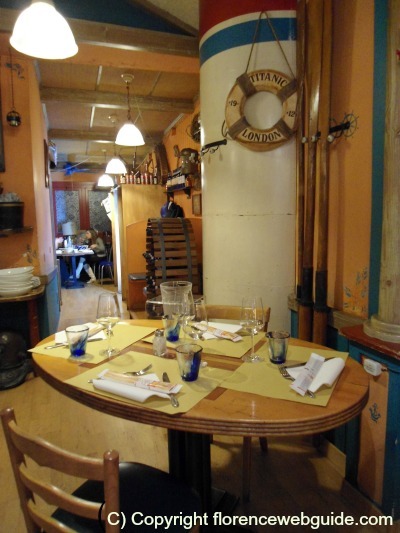 There's sea paraphernalia everywhere, the walls are orange and decorated with maps and the floors have boat-like wood planks. The tables are close together though and when the place fills up it can feel quite crowded (no good if you want a quiet romantic meal of course!). This fish restaurant does shellfish especially well and every dish that you see coming out of the kitchen will likely make your mouth water. The portions are generous and they don't skimp on how much seafood they put in the pasta dishes. The seafood is also very fresh - in fact Lobs also specializes in raw shell fish with gorgeous platters loaded with oysters, cray fish and other shell fish delicacies. If you like pasta with fish, I recommend their spaghetti 'Nettuno', a white seafood sauce with clams, shrimp, oysters, mussels, squid and cray fish - just scrumptious! Here's a pic below so you can see how much seafood they give you. For thoroughness, I do have to say that the service at Lobs is a bit hit-or-miss. So if you get the second type don't take it personally, it happens to the locals too! Acquapazza is a relatively new fish restaurant in Florence that has been winning fans since it opened. Why? Because it's a great mix of good food, both traditional and original recipes, creative presentation of dishes, decent size portions, and fair prices. The locale is modern and elegant - tables are a bit close together so it's not too cozy or romantic - but the decor is chic and sophisticated. Dishes are presented in the most modern of ways with sauces in mini-glass jars, food on slates, dressings decorating the plate, and so on. Lots of the dishes here are fish and vegetable combinations, extremely tasty but still on the light side. Ask your waiter for the latest inventions of the chef - sure to be unique! 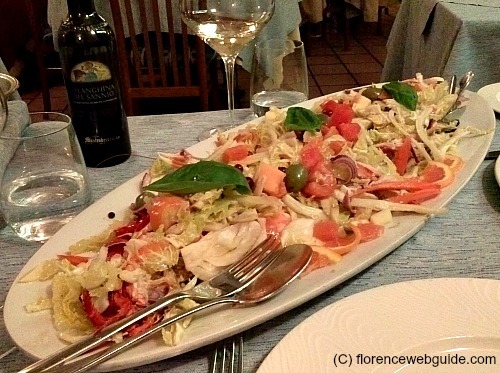 Of all the fish restaurants in Florence, 'Vittoria' is the most famous. This place is a local institution! A family run eatery, Vittoria is very proud to be an old-fashioned and slightly vintage type restaurant that sticks to traditional ways: a maitre d' in the dining room, waiters wearing vests and ties, classic furnishings and decor. As you walk in you see all the fresh fish in a glass display and as soon as you sit you are brought some complimentary starters and spumante - here the service is excellent and professional. And the food? This is where Vittoria is less old-fashioned! They have very inventive ideas, like using crushed almond to coat fried fish, tuna 'caponata' (a fish version of a Siciian speciality), and their own recipes for 'cacciucco' (mouth-watering Tuscan fish stew) and the 'catalana'. A word about the 'catalana': this is an Italian dish (with a Spanish name!) of steamed shellfish (lobster, jumbo shrimp, crayfish) served on a bed of luscious and enormously varied selection of salads and vegetables covered in a phenomenal vinaigrette - people go to Vittoria just for this dish which is exceptional! Vittoria is a great choice if you want to be surrounded by locals! 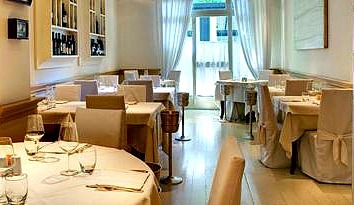 This is one of the Florence fish restaurants that offers innovative seafood dishes in a romantic atmosphere which takes you back to the elegance of an earlier epoch. The interior is a plush Liberty style with a twist, theater curtains surround the art-deco chandeliers recalling the world of the theater, and Fellini's film 'la Dolce Vita' is silently projected onto one of the curtains throughout the evening. The menu specializes in high-quality fish dishes without neglecting to include something for meat lovers and vegetarians as well. 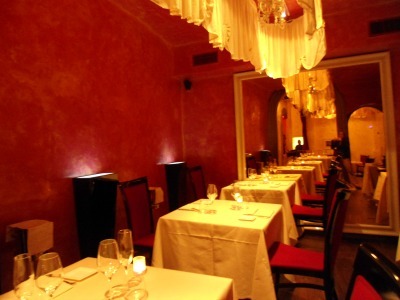 Fellini also offers gluten-free dishes of the highest caliber, from appetizers to desserts. With its intimate and refined atmosphere this is a perfect choice for a romantic evening. The lighting is subdued and the tables are spaced far apart guaranteeing a peaceful and relaxing evening meal (on weekends gets crowded though). 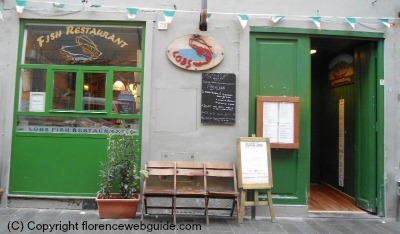 This is one of the few fish restaurants in Florence located along the romantic and elegant Lungarno. 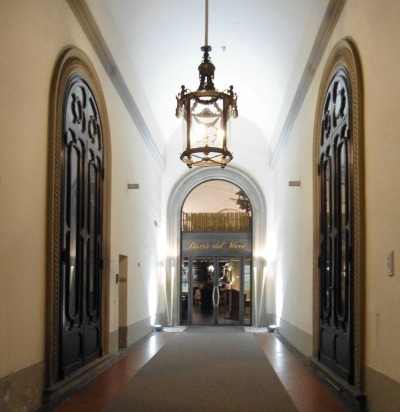 On the ground floor of a historic Florentine palazzo, Bistro del Mare is the type of place for a special evening. The decor, atmosphere and service are all refined and chic: waiters are very spiffily dressed and many dishes are professionally prepared for you right at your tableside. 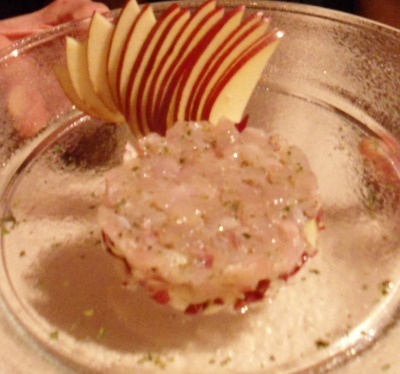 The menu is only fish, which is prepared in light modern recipes with an original touch (see pic below). Of course, you'll also find the traditional seafood spaghetti and other classics, but Bistro does not have an extensive menu, the choice is quite small in fact. Just about 10 or 12 very select dishes per evening. After all I've said, you're probably thinking this place is very expensive, right? Well, actually it's not. Prices are less than what you might expect for all this chicness! 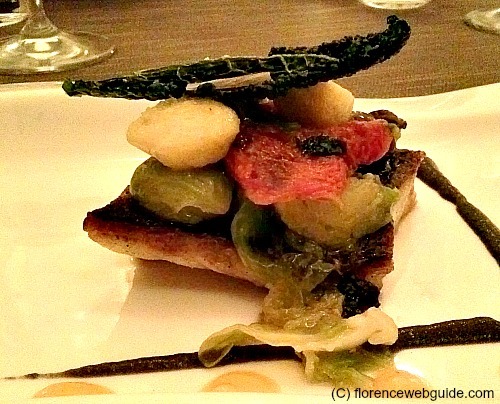 Looking for a fish restaurant in Florence for a special night out? Portofino is a real catch! Chic and refined, yet with extremely friendly and down-to-earth service (easy-going but highly professional too) Portofino is the perfect restaurant in Florence to spend a romantic evening. The food is excellent. Their classic starters include mixed seafood sauté with vegetables or soft tender squid cooked with sun dried tomatoes and served on a bed of potato pilaf. The menu offers about 5 pasta dishes and entrés, not a huge variety but a nice selection of classics (roast fish or pasta with seafood) and more original dishes. Portions are not too small either. Don't miss the apple tart served warm with cool English cream sauce layered with cognac! 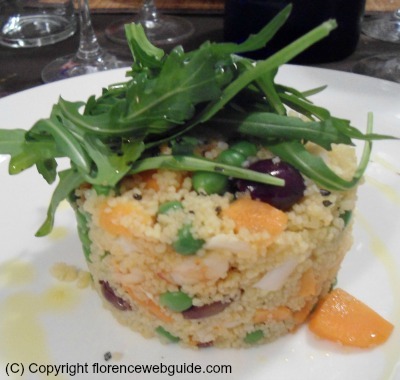 You might also like to read about an 'off the beaten path' fish restaurant in Florence called 'La Taverna di Pietro' - a very simple neighborhood locale with bargain prices.